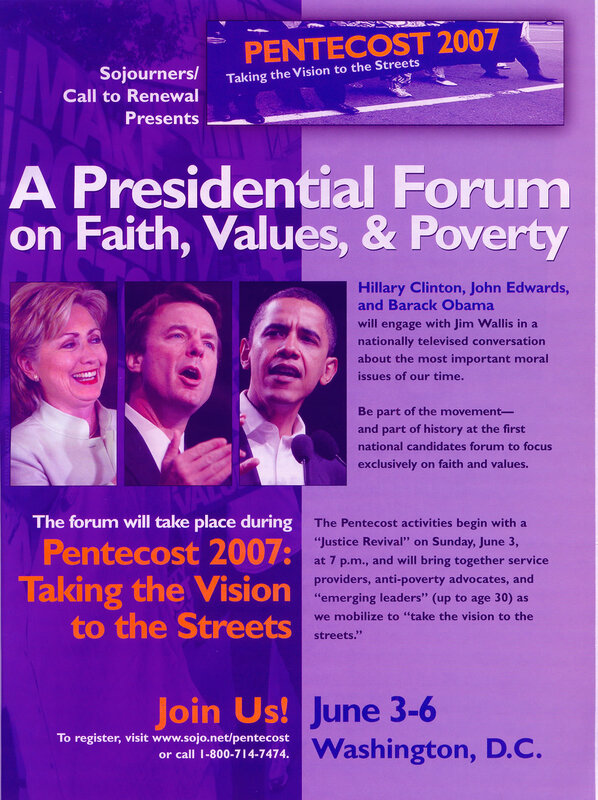 I must say that I am more than a bit uncomfortable with Sojourner’s billing of their June event , Pentecost 2007, with a “Presidential Forum on Faith, Values , & Poverty” featuring Clinton, Obama, and Edwards. While interesting, just a bit too closely “overlayed” onto “Pentecost 2007”, and all three are the Democratic frontrunners. Was it ever envisioned to have any Republican candidates (or would any of them come?) But I am more concerned with the extensive overlap of Pentecost and American political discourse. It would seem that the rushing wind of the Holy Spirit blows amongst a different kind of gathering (which isn’t to say that many people associated with this are not a part of that gathering, but I just don’t like this ad.) Perhaps William Cavanaugh, who just did a post on the God’s Politics blog, would have similar misgivings/difficulties with such an association with Pentecost and politics? This entry was posted in Uncategorized and tagged Church, SocioPolitical, Sojourners by Theoblogical. Bookmark the permalink.